It looks like the Tibetan cyberspace is getting a healthy dose of humour this year, finally! I already wrote about the fun, funny, smart and catchy viral rap video “Shapale” earlier this year and this week I have literally been lolling non-stop to a new Tumblr called ANGRY TIBETAN GIRL. 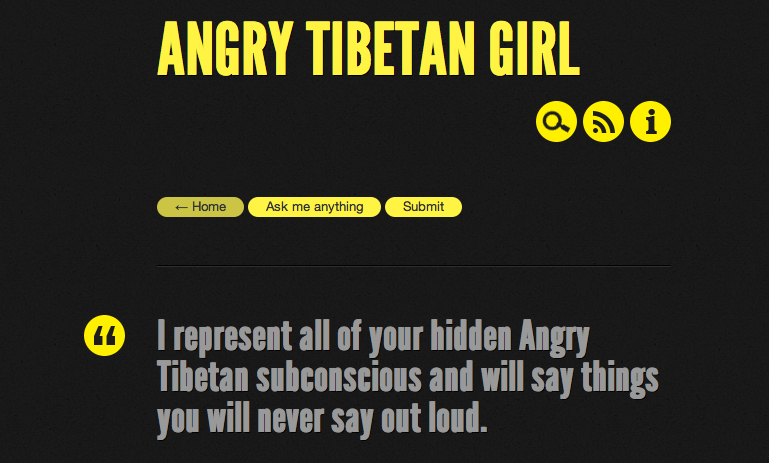 “Angry Tibetan Girl” is angry, and funny, as hell. There are so many posts with echoes of countless conversations I have had (!) and been part of (!) with Tibetan friends which were often non-stop rants. Yes it’s uncomfortable to admit but it feels SO GOOD to rant! That’s why I love Angry Tibetan Girl – she just says what we’ve all been thinking! For a while now I’ve been following AsianGirlProblems on Twitter, she is hilarious but it’s so nice to have something specifically Tibetan. Even the small things really hit home to any Tibetan, like not knowing your grandmother’s name (it’s Momo-la!) … and there really is nothing quite like the anger you feel when your khata is stuck in your bag zipper, right!? You can’t get the khata out and you will never be able to open your bag ever again! Aargh! And then today, I’m almost recovered from reading Angry Tibetan Girl when I notice a link posted all over Facebook to the forum page of Tibetan website “Phayul”. 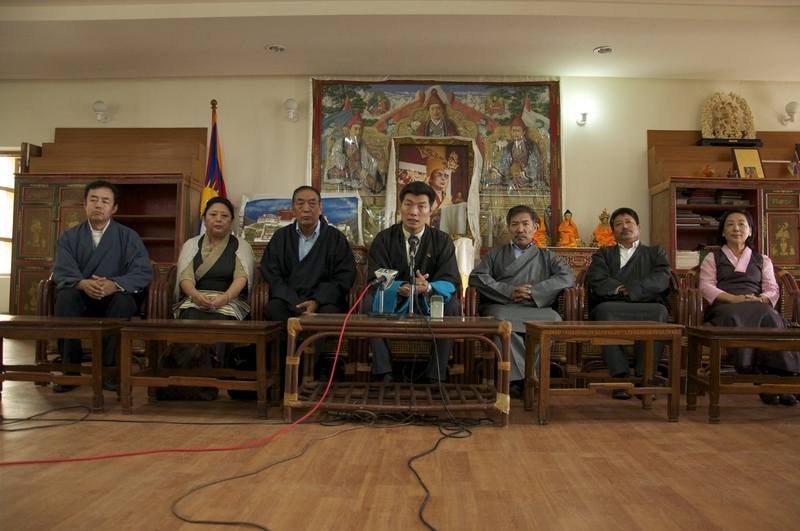 It turns out to be a super funny analysis of the new Ministers and MPs of the Tibetan Government in Exile (or whatever it’s called) and their fashion choices! Someone on the forum calling themselves “yakdri” has cast a sharp fashion eye on our political elite and it’s quite brilliant and insightful. Nothing is lost on “yakdri”, everything is commented on, the traditional Tibetan dress (chuba), the blouses (wunchu), hair, shoes and accessories. There is even advice on what to wear and what not to wear. I remember the German media having a field day when Angela Merkel became Chancellor and had a complete makeover, why not scrutinise our Tibetan politicians in this way too?! Hope you enjoy Angry Tibetan Girl and the Tibetan Fashion Police (this surely has to become a blog!). Everyone knows that Tibetans love to have fun and are hardly ever serious, at least not for long. And I don’t think anyone likes to make fun of other people as much as we do – Tibetans are very funny people in real life but you’d hardly ever think it from what you read about Tibetans in books, that’s why I am really loving this online reflection of the Tibetan personality!